I've written about Jack Herrington's Code Generation in Action before; it is a great book for stimulating your thinking on how you go about producing code. JDeveloper has evolved into one of the strongest IDEs when it comes to code generation. It's not explicitly mentioned in the book however. That's not a criticism of the book, but it does beg a review of how JDeveloper stacks up against the concepts covered. Writing a code generator can be difficult-but convincing your fellow engineers to use [it] can be even more difficult. The key .. is to make it as simple as possible to use. 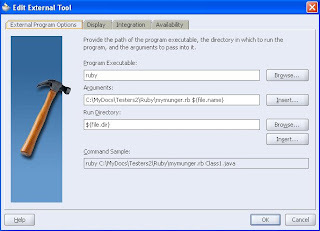 IDE integration is one approach to address this problem, and the common techniques supported are external tool invocation and filtering. 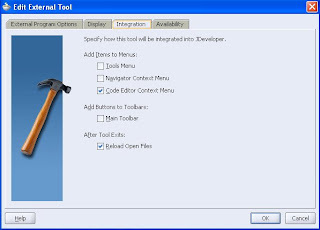 JDeveloper only directly supports external tool invocation (see the Tools menu). For instance, you can call simple Ruby scripts like the following to perform file-level processing (this example simply comments each line of the file that is currently open in the editor pane). NB: in the 11.1 preview, it seems the "Availability" conditions are still a little broken and it is not possible to make commands available only when a file (or certain type of file) is open. Filters are not directly supported by JDeveloper, however implementing a filter is a fairly straight-forward project using the JDeveloper Extension API. Herrington does not directly address the topic of IDE APIs, which is understandable given the scope of his book. However if you are looking to implement complex and very specific code generation approaches you will probably want to look into this topic further. JDeveloper comes with a comprehensive Java-based extension API which was significantly revamped in (I think) 10.1.3 to bring it into line with the standardisation efforts of JSR-198. I must say documentation of the extension development process is a little thin. And it is only in 11.1 that JDeveloper has explicit project support for extension development (although I find it a little broken and mysterious in the preview edition). The best approach at present seems to be good ol' copy-and-modify the extensive set of samples provided by Oracle at the Extensions Exchange. There is a growing number of 3rd party open source extensions that are even available through the JDeveloper Check for updates menu. Still, no filter add-in is available, and you are of course stuck with developing in Java. It of course puts me in mind of a little project: a simple filter add-in that then allows you to invoke a filter process developed in the language of your choice such as perl, ruby or python. Maybe I'll be able to follow-up this post with an example;-) PS: yes I did; you can read about it here. I've been hedging around the fact that JDeveloper is very significantly geared towards code generation itself. It is one of the main drawcards for why you would use it over your favourite text editor. Web Services Java XML-RPC XML-RPC Generator n/a? *I've reclassified these items from the original table in the book. NB: I generated the table above using an OpenOffice Calc spreadsheet [generator-taxonomy.ods]. Good example of dog-fooding perhaps;-) I've always found Excel/Calc to be really useful tools for rapidly generating scripts, SQL or HTML fragments like this. It seems to be an inherent trait of developers (arguably a good one), that generators and wizards are not fully trusted and accepted until you've had the chance to dig down under the covers. That's simply a lot of work for all of JDeveloper's features, and there isn't a great deal of information available to help your short-cut the process. The natural conclusion is that to optimise adoption, I'd exhort the JDev team (and the community of users) to put as much effort as possible into producing resources for JDeveloper's code generation (wizards etc) and extension SDK. Importantly, to put the stress on explaining the how and why these things work (not just step-by-step tutorials). Shay Shmeltzer just posted a useful summary of How Do I Start Learning JDeveloper and ADF? Eduardo Rodrigues has a great post on his favourite JDeveloper extensions with some good recommendations of what you should install or at least have a closer look at.